Sofiane Belaskri is a young manga author based in Oran, where he is studying civil engineering. Belaskri has drawn the series Drahem in Laabstore magazine, which was published as an album by Z-link in 2010. His album Le vent de la liberté was also published by Z-link in 2012. He has been part of two Algerian anthologies of comics: Monstres (Dalimen Éditions, 2012) with his short graphic story Le fantôme (The Ghost) and Waratha I (Dalimen Éditions, 2012) with J’avais un rêve (I had a dream). Belaskri came second in the Young Talent prize during the 2011 Algeria International Comic Book Festival (FIBDA) and has been part of the team of comic artists who represented Algeria at the Angoulême International Comics Festival in 2013. I started to draw before I learned to read. With time, I wanted to tell stories with my drawings and the only way to do so was through comics. When I was 13, I discovered that the majority of cartoons I watched on TV were comic book adaptations, thanks to friends who brought me the Dragon Ball mangas from France. From then on, I started to do research about comics in general and I really liked it from the very beginning. Since I’m pretty much self taught/an autodidact, my only source of inspiration for some time was the few manga books I had in hand. Step by step, I started to write my own stories and draw them, trying to get better every time. Thankfully for me, things have started to move in the country, first with the publication of the manga magazine Laabstore, then with the Algeria International Comic Book Festival (FIBDA). Comics allow me to say what I want to say without needing too many things: just a pencil, black ink, an eraser and a few sheets of paper! Generally, I like to tell social stories, about young people, with an Oranian or Algerian touch. Where I come from, the capital of Ain el-Turck District (located about 15km from Oran – an Algerian city on the Mediterranean sea), the issue of harragas is not out of the ordinary. Every day you see young people dreaming of illegally reaching the shores of Europe. Many of them actually try. These young people who risk their lives to reach a Europe they see on TV are misunderstood by many, and I used to be one of them. But if you think about it, they are only people who have not accepted their daily lives where each day is full of ‘emptiness’. They just want a better life! 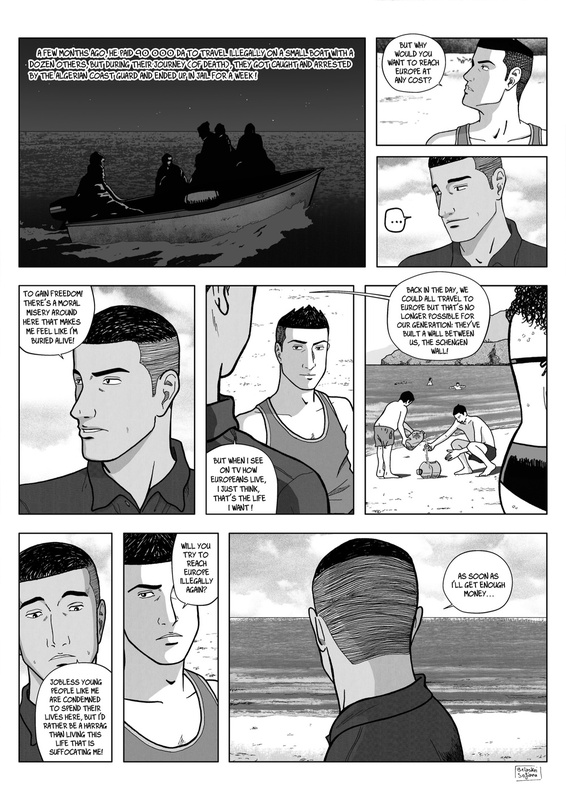 This is the reason why I wanted to tackle that issue through my comic, which shows a conversation I had with my friend Houri, trying to understand why he tried so hard to reach the Spanish coast. Harragas comes from Arabic حراقة, ḥarrāga, ḥarrāg and means “those who burn” (their immigration papers). It concerns North African migrants who attempt to illegally immigrate to Europe.